My esteemed colleagues over at Deep-Sea News have declared this week (April 27-May 3) "Coral Week" and have gone into insane 100% coral-all-the-time mode. So at Dr. McClain's delicate urging I thought I would present a little somethin' somethin' on the echinoderm-coral intersection. 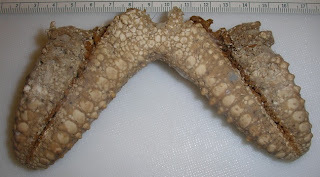 Sea Cucumbers (Class Holothuroidea) & Crinoids (Class Crinoidea): As far as I know, sea cucumbers and crinoids don't really interact directly with corals other than as substrate or when they form habitats (as in tropical shall0w-water or deep-sea coral reefs). And if you don't believe me about cukes not eating corals..ask Dr. Seville Kent from 1883 (note: this made Nature in the 19th Century!!). So, not much on those groups here. * Several deep-sea "serpent stars"(Phrynophiurida) i.e., those with big fleshy arms that split into massively branched arms such as this that often live on octocoral hosts. *The Ophiacanthidae-a weird but diverse group of globally distributed spiny brittle stars). Shown here co-occurring with some deep-sea coral. and other aspects of feeding ecology and reproduction. Perhaps though, one of the most significant relationship between echinoderms and corals is that several echinoderms EAT coral!! 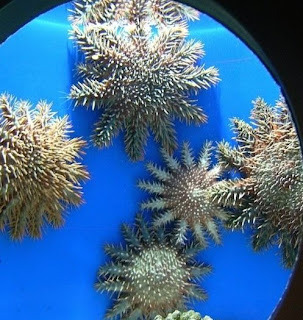 Let's take a look at some prominent corallivorous echinoderms, shall we? One of the few non-starfish echinoderms reported to feed on coral..Diadema is a member of the family Diadematidae, which are recognized by their long sharp, needle-like spines. Diadematids are widespread throughout the tropical Atlantic and Indo-Pacific occuring primarily in shallow-water reef habitats with some deeper members. Diadema is primarily an epifaunal algal grazer, leaving scar marks on substratum with relatively minimal corallivorous propensities. 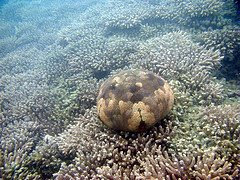 What's curious is that much of the review literature (citations available upon request) attributes coral as a food source, when it may actually be that much of the perceived "feeding" is in fact, grazing. 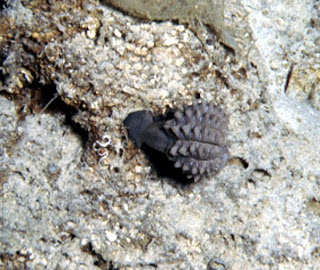 Only one paper-Bak & Eys 1975 reported feeding in D. antillarum with gut content reports but reported "scars" from coral heads as well as various outlining various prey species but that doesn't really convince me that feeding on coral polyps was not merely incidental. 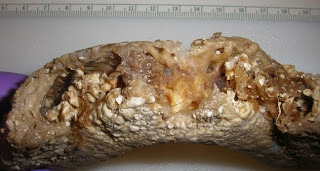 Hippasteria (and the related genera Evopolosoma and Cryptopeltaster) are large, heavily calcified starfish with big thick spines that live primarily in cold-water areas, in other words the polar/sub-polar or deep-sea settings. There are about 25-30 species with members occuring in the Arctic, New Zealand, Hawaii & Japan (deep-sea), the North Atlantic, the tropical West & South Atlantic (deep-sea) and throughout the North Pacific. 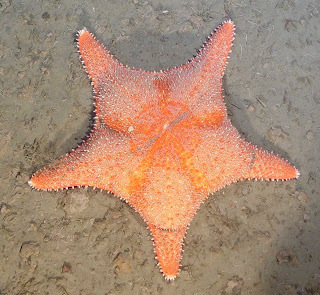 Krieger & Wing 2004 reported from their Alaskan/North Pacific study areas that in some of their study areas, Hippasteria spp. accounted for up to 45% of polyp predation on the soft-coral Primnoa. 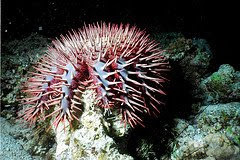 The North Pacific Hippasteria spinosa was reported by Birkeland 1974 to feed primarily on sea pens. A widespread genus with three species occuring throughout the tropical Indo-Pacific region. From Hawaii to India and the east coast of Africa. 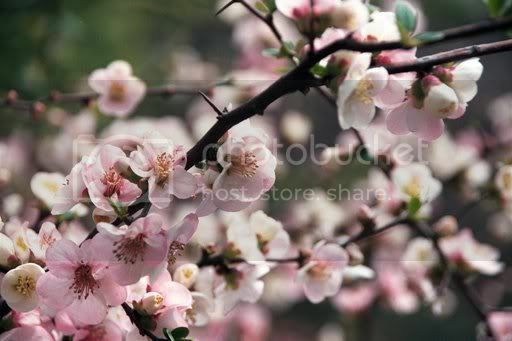 Varies widely in color and morphology but maintains its distintinctive swollen appearance. The name, Culcita, is latin for "cushion". Based on lab feeding results, Culcita can eat 1.0 square meter per year of Pocillopora or 0.9 square meters of mixed coral prey. 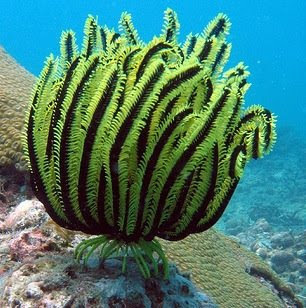 This represents ONE FIFTH of the feeding rate of Acanthaster planci (see below) which is about 6 square meters a year. 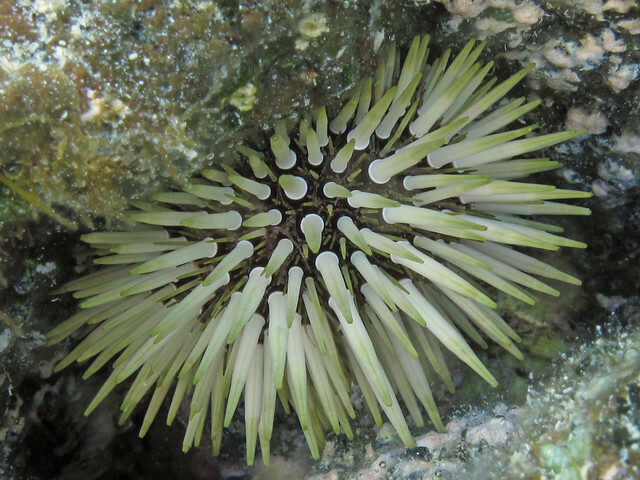 Abundance of Culcita is also FAR below what Acanthaster reaches.. Culcita was reported in one instance approaching 25 individuals per hectare vs. 65 individuals per hectre for Acanthaster. Based on this, it seems doubtful that Culctia could have a deleterious effect on reef growth. 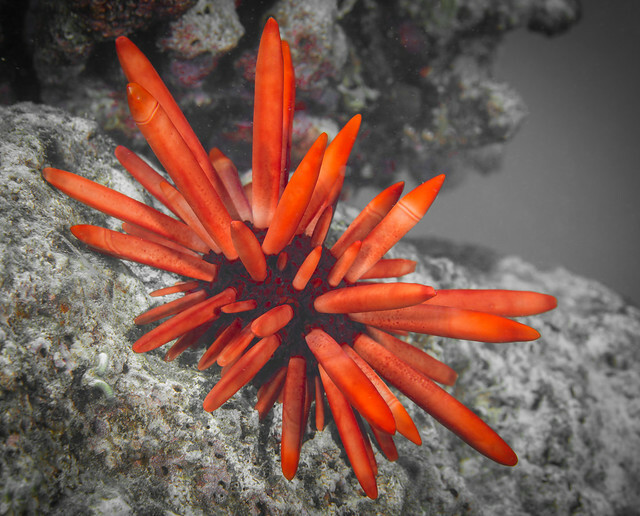 HOWEVER, Culcita seems to feed primarily on younger colonies and thus, could have an effect on coral community structure by limiting abundance of one species over another in different areas and in conjunction with Acanthaster could affect coral population structure. 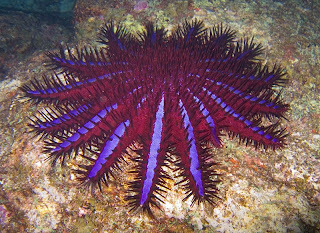 aka the Crown of Thorns Starfish or...COTS by some. The BIG one. A caveat here..this is a SHORT summary. Based on the amount of literature available on this animal, I could literally spend a whole frackin' WEEK just on the COTS. Pursued, studied, and in many cases destroyed due to their perceived threat to shallow-water tropical reefs. Probably one of the most notorious, and as a consequence one of the best-studied, starfish in the world. 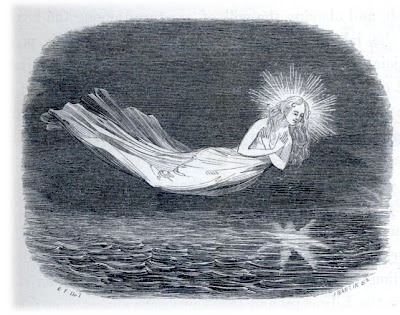 The COTS is widespread, occuring from Hawaii and southern Japan to the Pacific coast of Panama to the Indian Ocean on the east coast of Africa and as far south as the subtropical Kermadec Islands. Acanthaster varies widely over this range in color and morphology. A whole book is devoted to the biology and ecology of Acanthaster planci. Much of my info here hails from this useful volume. Individual animals can ingest up to 6 square meters of living reef a year. Accounts of these outbreaks have been estimated based on relative size based on catch records. Another study from American Samoa collected 486,933 but "so many thousand remained that no estimate was made of the proportions killed"
Interestingly, abundance can fluctuate by as many as six orders of magnitude within a year or two. For example: Prior to late 1977, numbers of A. planci in American Samoa were of the order of less than 2 per year, as observed by "knowledgeable persons". By late 1977, HUNDREDS of THOUSANDS of starfish appeared on both sides of the main island!!! The outbreaks are natural. 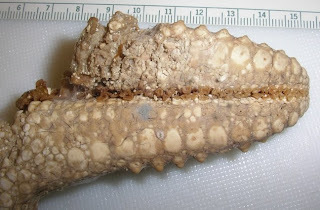 Analysis of Acanthaster ossicles (i.e., fossil remains) were analysed and showed regular fluctuations. 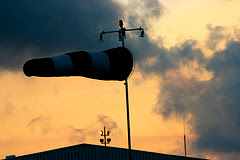 Outbreaks are caused or directed by anthropogenic (i.e., man-made) forces. For example, increased nutrient run-off from land resulting in higher juvenile survivorship and thus greater adults. 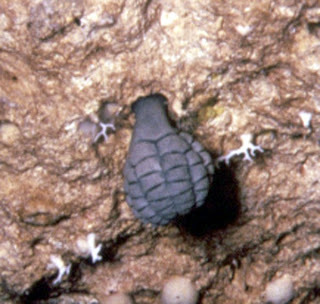 An older idea, that overfishing of giant "trumpet shell" snails (Charonia) resulting in loss of natural predators has essentially been discounted as the sole cause. Echinoderm Big Battle! Sea Urchins Feeding on Stalked Crinoids!! So, the other day, I was giving a tour and making the point that as much as the scientific method is a critical part of our analytical process, an important part of science is primary exploration and discovery. Something people seem to forget amidst busy times. New facts or observations (some would say qualitative data-others would say "natural history") can inspire many new questions and a diverse array of hypothesis-driven studies. A simple observation can drive a host of inquiries!! A case in point? Let's look a very interesting recent paper by Baumiller, Mooi & Messing 2008 which documents an observation that has repercussions for paleoecology, paleobiology, and broad evolutionary dynamics. 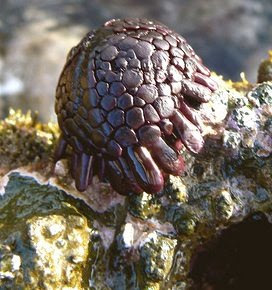 The cidaroid sea urchin-Calocidaris micans. 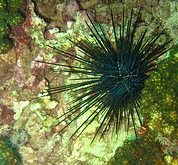 Cidaroid sea urchins are considered among the oldest and some would say more "primitive" within the class Echinoidea (Another way to say this is that cidaroids are sister taxa to modern echinoids). 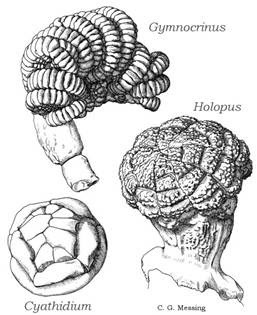 Fossil occurrence for cidaroid sea urchins extends back to thePaleozoic (approximately 251-542 Millions of Years Ago). 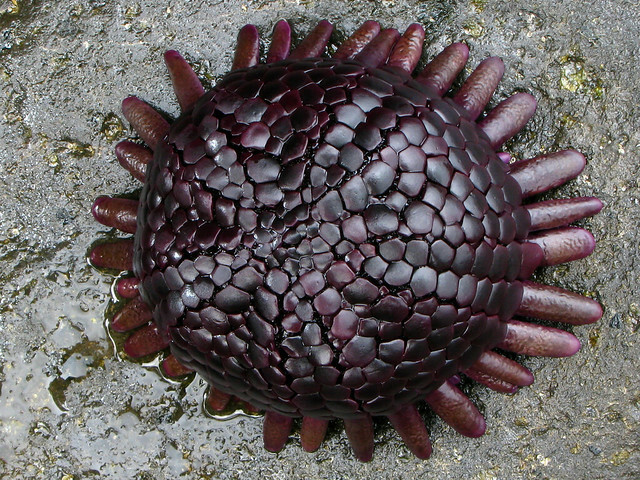 Today most cidaroid sea urchins live in deep-sea habitats and can be quite abundant. Cidaroids are unusual in having an specific kind of Aristotle's Lantern and in lacking skin on their blunt, thick spines. 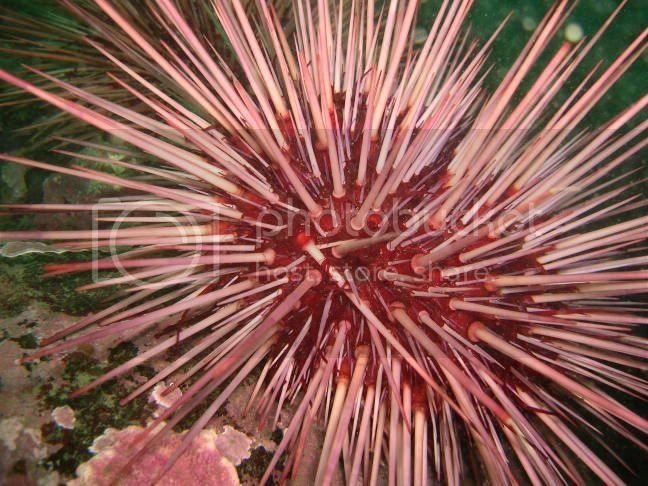 Most sea urchins (and in fact, most echinoderms) have skin covering their entire body. This species occurs in the tropical Western Atlantic, specifically in the Bahamas. Bear in mind, that often, deep-sea invertebrates like this, very rarely if EVER get to be observed in the wild. So our knowledge of their life habits is negligible. Based on observations from the Johnson Sea Link submersible the authors watched Calocidaris FEEDING on Endoxocrinus!!!! A sea urchin chewing on a stalked crinoid! An interaction never before observed between these two kinds of animals! Also: stalked crinoids have been known to shed distal segments of their stalk..but up until now the explanation for that behavior was a mystery. 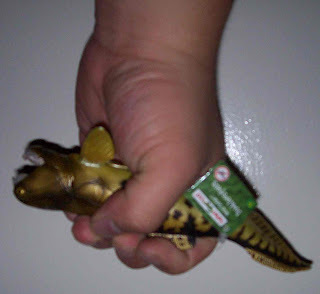 Think of a "lizard's tail" strategy. 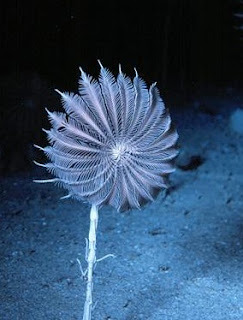 Stalked crinoids will jettison parts of their stalk to distract the predator allowing the surviving part of the animal to escape!! Did Paleozoic cidaroids feed on Paleozoic stalked crinoids in the same way? How many other cidaroids feed on other stalked crinoid taxa? Could predation by slower benthic predators have affected the evolution of stalked crinoids and their morphology? 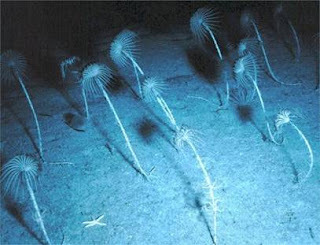 Finally, one of their most intriguing notions: Swimming in stalked crinoids (below) has been argued in the past as an escape/defense mechanism against predatory fish. But "Doesn't a slow-moving, kind of clumsy looking swimming thing in the water column really just seem to INCREASE the chance that a fish would eat it??" What if it was a defense mechanism against other SLOW benthic predators??? 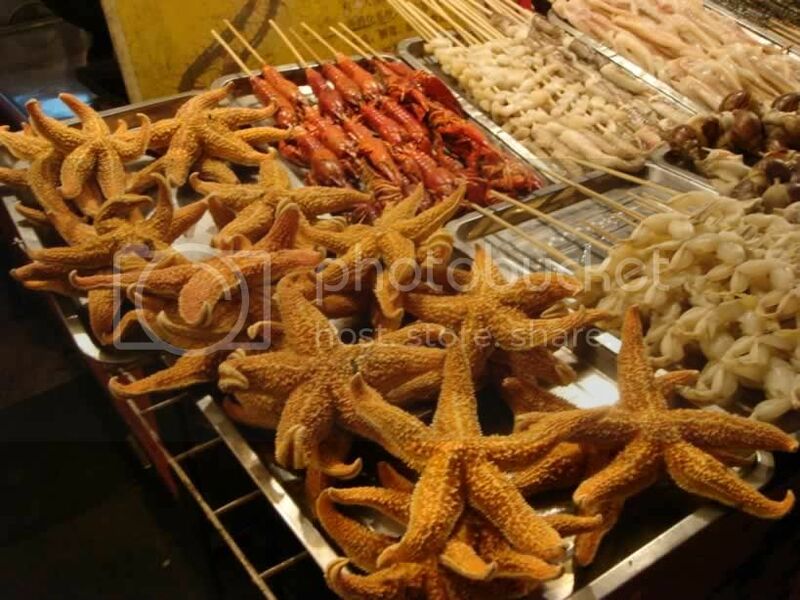 Sea urchins, starfish and...????? Think of the scallop using a jet blast to propel itself out of harms way when a starfish attacks. With implications for over 500 Mya of evolution and ecological interaction. ALL actually all members of the SAME Family!! 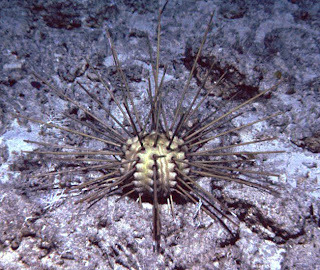 (i.e., the same group)-the ECHINOMETRIDAE. Here are all their tests (their skeletons for comparison). Note how these all have that oblong, almost bilateral shape to them. Its all about the spines! They all vary with habitat! Evolution is a wonderous thing! 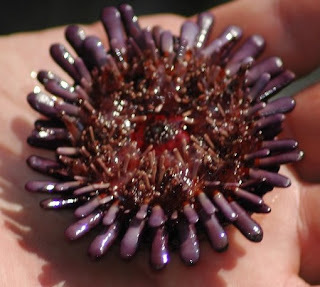 Holding on in a Rough World: Colobocentrotus atratus-the Shingle Urchin!! Today's we shift gears from starfish and take a look at sea urchins! 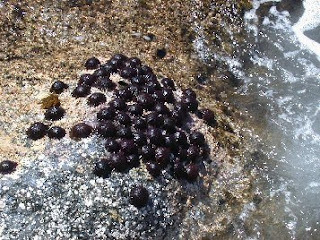 Today we look at Colobocentrotus atratus (Echinometridae), a commonly encountered resident of the South and Central Pacific rocky intertidal. If you've ever been to Hawaii they can be frequently encountered along the edge of the harsh-wave swept habitats along its beautiful volcanic shores. Notice the uniquely flattened shingle-like mosaic of modified plates covering the surface as well as the flange of flattened spines forming a close fringe around the edge. 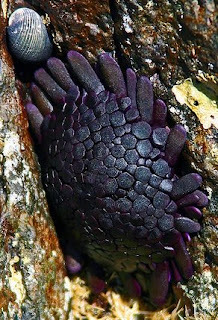 Colobocentrotus lives in heavy wave-swept environments and its smooth, flattened plates lead one to automatically interpret them to be adaptations for surviving in these kind of environments. A recent paper by Santos & Flammang (2007) investigates the biomechanics of how these neat beasties hold on. It turns out..its ALL in the TUBE FEET! 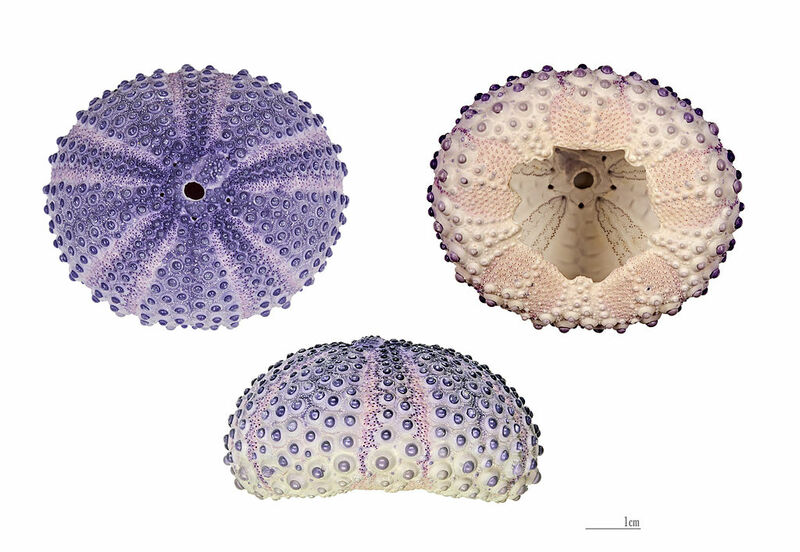 They measured the adhesion of this species against other more "normal" sea urchins (e.g., the spiny Echinometra) and they found that Colobocentrotus always presented the highest measured values. * Colobocentrotus' attachment force allowed it to resist dislodgment up to water velocities of 17.5 m/s and even up to 27.5 m/s!!! In contrast, more "typical" echinoids, like Echinometra were disodged by water velocities superior to 7.5 m/s. How fast is 27.5 m/s?? * The shape does not appear to affect the difference in drag and lift but may function to offset the amount of shear force directed onto the animal into normal force..effectively spreading the energy load around more evenly on all tube feet. 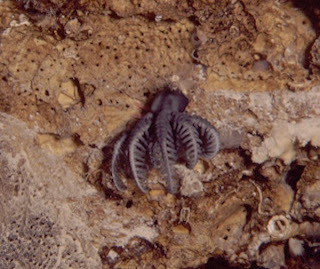 Thus, it seems that the ability to inhabit extreme water velocities in Colobocentrotus is tied to its very high number of tube feet and not to its particular morphology (although it does seem to help in other ways). 1. The streamlined morphology might be an adaptation to lessen other hydrodynamic forces such as wave impact. 2. The flattened spines may reduce spine breakage and therefore the energy expense of constant repair, etc. 3. The morphology seems ideal for retaining extra water which can be essential to resist heat and dessication stress at low tide. Tough little wee beasties...so for goodness sakes! leave em' alone when you go out tide pooling! 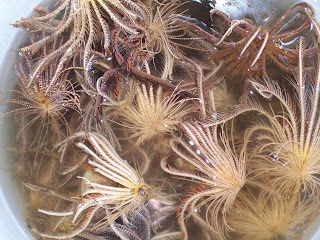 Taxonomy: From the video and from various pictures floating around on the internet, the species looks like Asterias amurensis, the North Pacific species of the well-known asteriid Asterias, which includes your well-known experimental lab rat Asterias rubens, etc. *I have two packages of a starfish soup mix from Asia that apparently use the starfish as a component you add to dried fungus and boiling water. *There were rumors when I visited New Zealand that people were using tube feet as part of clam dip. * Body walls, of many, if not all asteroids are laden with toxic biochemicals, from saponins to tetrodotoxins. 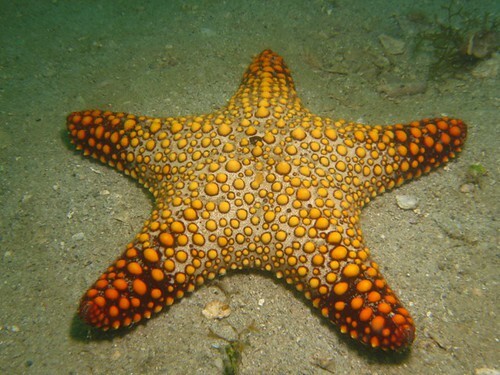 Many accounts report that feeding starfish to dogs or cats results in vomiting and the subsequent death of those animals. * Some accounts-especially from Asia, such as this one, show that that some species which digest bivalves (e.g., Asterias amurensis, Astropecten scoparius, Asterina pectinifera) can actually convey paralytic shellfish poisoning. Today, a little bit of sharing about my professional life and a story about helping people with my taxonomic expertise. Among the the skills I've found most useful (and necessary) in my profession is my skill in taxonomy-identification, classification, and all of the associated history which accompanies the knowledge about a specific group of organisms. In my case, the starfishes. 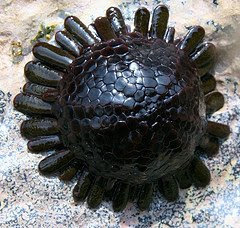 Class Asteroidea in the phylum Echinodermata. I am often consulted by a wide array of agencies, professionals, and interested persons to identify their animals from a wide variety of sources. Some from specimens, some from videos, and frequently from pictures. removed by the stomach pumping. They are interested in determining whether or not the starfish was actually the culprit in causing the seizures. no way to determine what else may or may not have been associated with the seizures. I have no idea what the stability of tetrodotoxin or other marine biotoxins is, but drying might not be too harsh on them. I also don't know if there might have been a preservative of some sort applied to the starfish that could be responsible, rather than the starfish itself, but I think they can just be dried, and it doesn't look like there's any shellac or painting on it. Can you identify it from the attached images? and if not would the identification be possible with the actual specimen in hand? Most of my requests for identification are biodiversity related-so it was unusual to get one with a chewed-up, half-digested specimen and involved with a canine death no less! I have over 10 years of experience with identifying starfish..and even so, its not easy to ID a species from pictures of fragments- but I got it: Pentaster obtusatus. A commonly encountered Indo-Pacific oreasterid that often makes its way into shell and curio shops. Unfortunately, it was chewed up and swallowed by this dog. Many starfish contain saponins and other toxic biochemicals in their body walls..likely as a defense against predatory vertebrates. And much of the older toxicological studies "back in the day" report dogs and cats inadvertently eating starfish, such as this one, exhibiting similar symptoms, followed by death. I was able to quickly report to the inquiring veterinarian about the likely nature of the cause of fatality and its toxicology. There were certainly several unanswered questions here...but knowing the name of this poor beastie was an important fact in this case and I was happy to provide an answer that helped figure it out. And REALLY..how often do you get people creating great folksy tunes about Paleozoic fossils? The Echinoblog will be an ongoing venue for collecting and presenting perspectives, popular news, and articles on the Echinodermata! Echinoderms are a phylum of exclusively marine animals, that are familiar to almost anyone who has heard of the ocean. The group’s living members include starfish (Asteroidea), brittle and serpent stars (Ophiuroidea), sea urchins, sand dollars, and sea biscuits (Echinoidea), feather stars and stone lilies (Crinoidea), and sea cucumbers (Holothurians). Tired of modern echinoderms? There are easily two to three times as many major Paleozoic echinoderm groups. Many of which are strange and unusual forms that one could easily mistake for extraterrestrial life on another ocean! *Short articles on various aspects of echinoderm biology that highlight various taxa and topics of interest. *Collected popular news articles featuring different echinoderm taxa. *New developments in the professional field of echinoderm biology highlighting as many different disciplines as possible: paleontology, conservation, systematics, deep-sea biology, ecology, reproduction, etc. *Anything that seems of general interest. I hope to update multiple times throughout the week-sometimes shorter, sometimes longer. I am happy to entertain contributions if you have something to say about your research project or announcement for an event, or whatever. Please feel free to comment or email me! I'd love to hear from you.